August is a frantic crossroad month when Summer management runs into the needs of Winter colony survival. 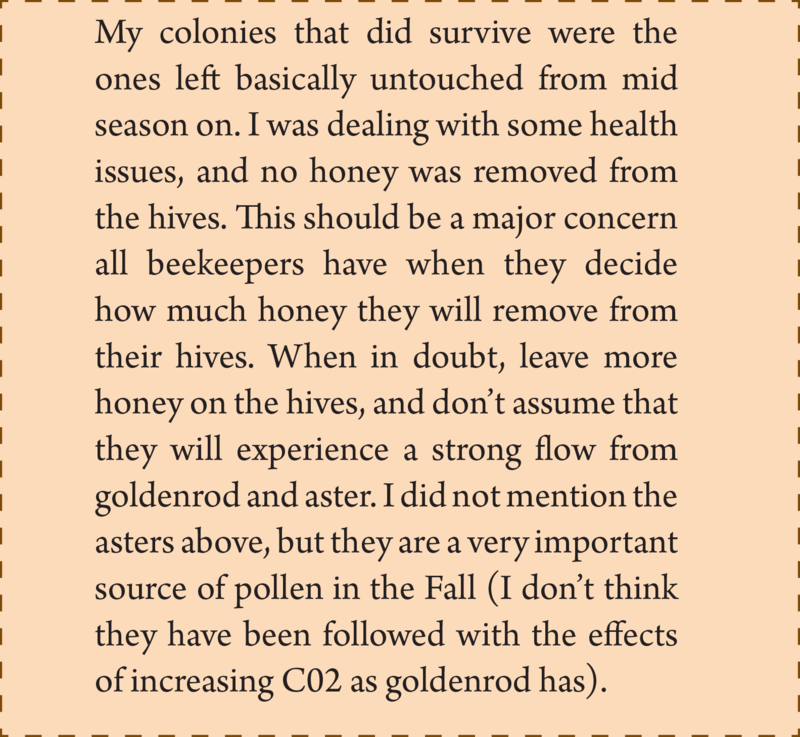 While I have written about this before, I feel that it is one of the most misunderstood basic principles of beekeeping, and must be reviewed. 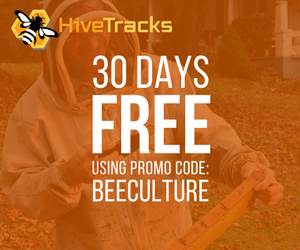 If you are a new beekeeper, this is one of the essential times of the colony management season that many beekeepers ignore for some unidentified reason. 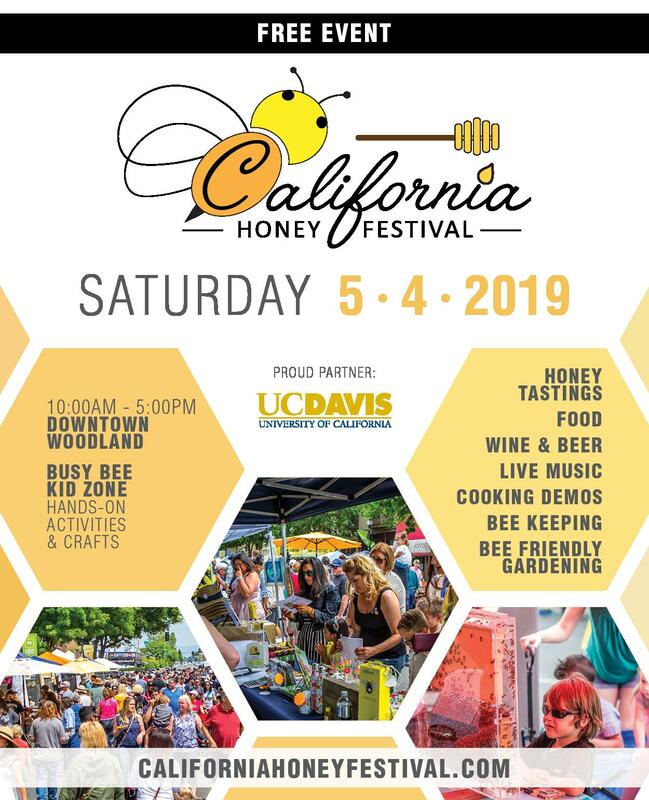 Harvesting honey – This often is when beekeepers remove the summer honey crop from plants like the clovers, spotted knapweed, and even the honey produced during the spring from fruit bloom, tulip poplar, black locust, basswood and sumac. It is important that they let the bees ‘ripen’ the honey adequately and the moisture is low enough to prevent fermentation in the container. 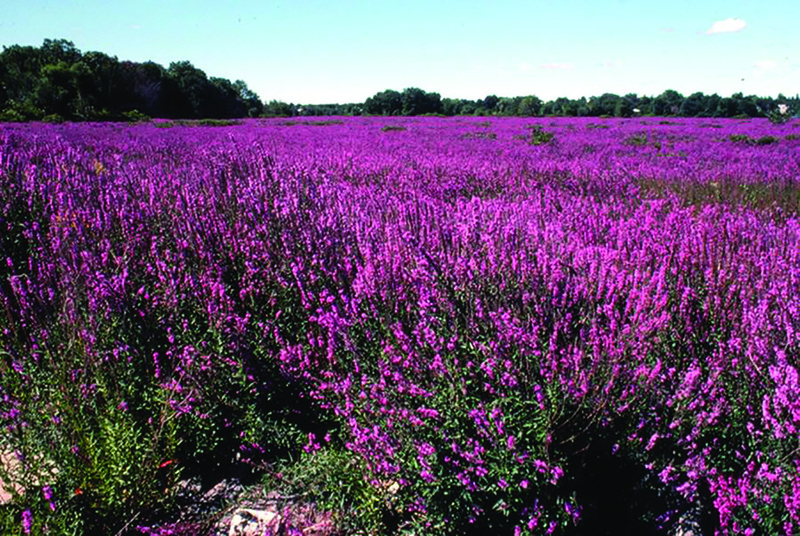 Purple Loosestrife is a good honey plant, but tends toward invasive. 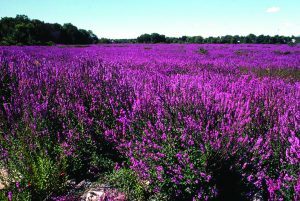 Producing honey – Some beekeepers have apiary locations where their bees have access to those ‘horrible and invasive’ nectar sources like purple loosestrife and Japanese knotweed. These two species bloom in August and into September and, in some areas, produce a major nectar flow. The politics of invasive species drives me insane. There are groups of nature organizations, government agencies and farmer organizations that support the removal of certain invasive species in North America without ever mentioning the removal of other invasive species, like apples and humans. 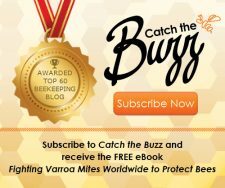 Varroa mite treatments – After the flow is over and the spring and summer honey crop is removed from the hive, many beekeepers try to squeeze in a Varroa mite treatment before the nectar flow from the goldenrod and asters start. 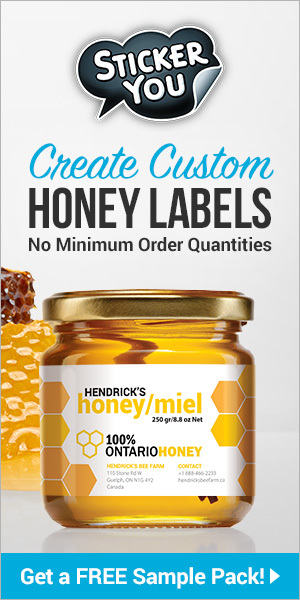 This can be a tight fit to comply with the miticides label for some compounds, but it will provide a treatment at a time that colonies that have higher mite levels will benefit from the mite reduction. I find that many commercial beekeepers use this window of opportunity to apply one of two or three treatments they make every year. Goldenrod may not be as valuable as it once was. 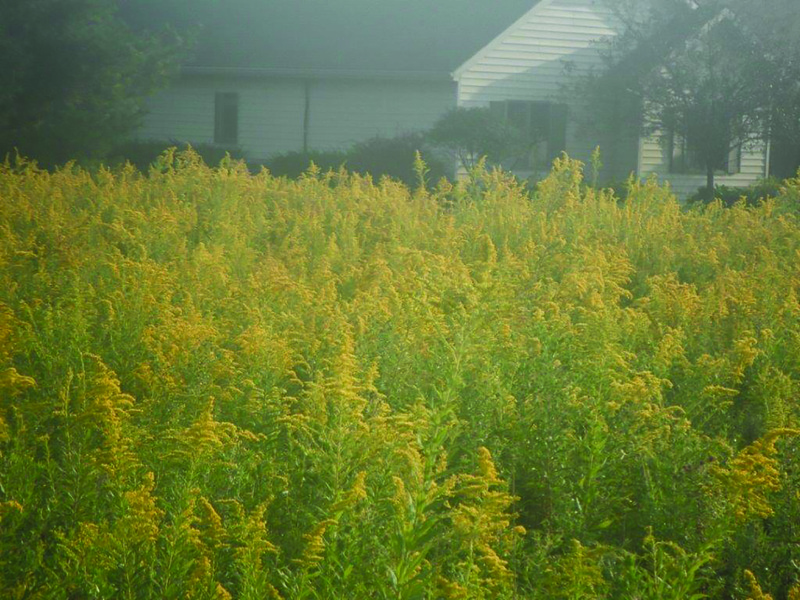 Many beekeepers’ colonies benefit from goldenrod nectar. Or not. 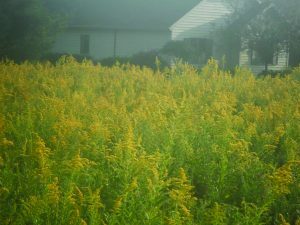 There is evidence that goldenrod is producing differently than before climate change was recognized as a major component in North American apiculture. If the plants are producing pollen with less protein and little or no nectar, it is a dramatic blow to many beekeepers in their colony management. During the past few years I have left the goldenrod and aster nectar on the hives, letting the bees ripen it and use it for Winter survival. For the bees, August marks the start of their New Year! Happy New Year bees! 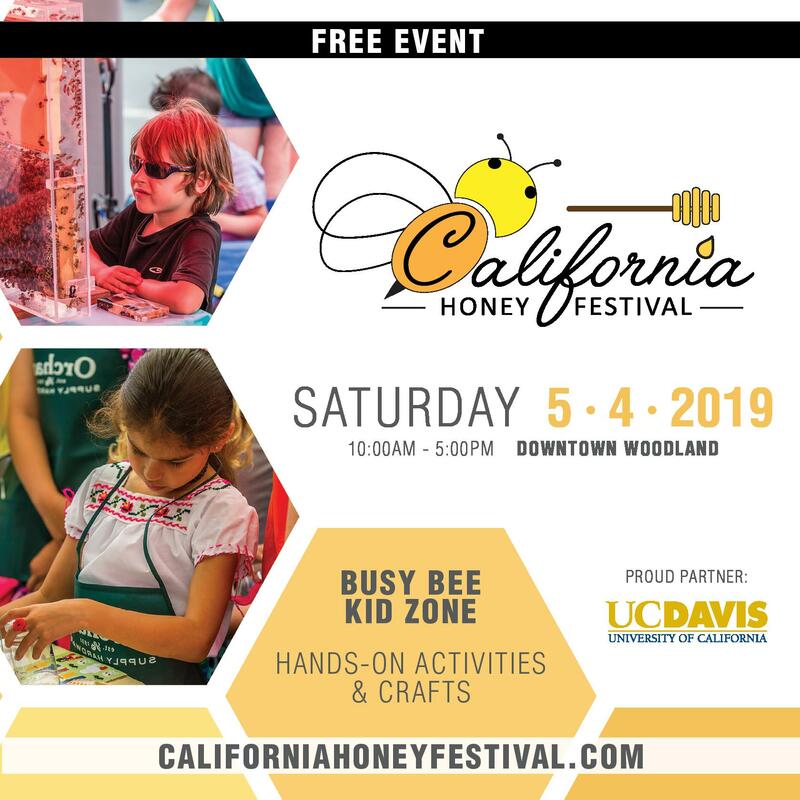 This is the time of the season when colonies start the cycle for next year’s season by producing healthy and vigorous worker bees that will raise the final cycle of bees before Winter. The bees do not celebrate, and nor should the beekeeper, as it is essential that the beekeeper make sure the colonies have adequate pollen and honey nutrition entering the hive during the mid-August to mid-September period. Colonies that do not produce a healthy, well-fed brood cycle of late Summer bees will not have the nurse bees needed to produce the Winter bees, aka the Fat Bees. These are the bees that must live five to seven months and raise the first cycles of brood in the colonies during the Winter when flight is not possible in northern states. They are different from Summer bees because they carry nutrients in their cells that help raise the Winter brood. 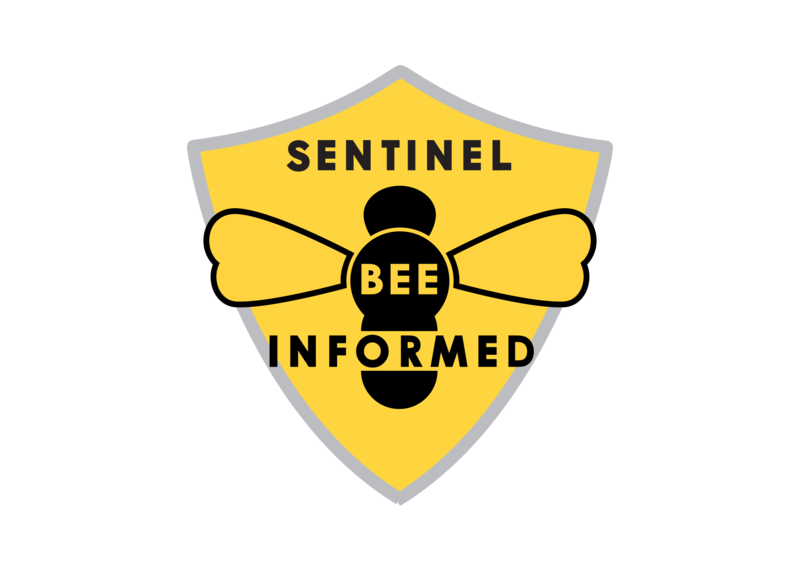 A growing number of beekeepers are putting out dry pollen supplement during August when there is no natural pollen flow. They use the dry material to avoid issues with small hive beetles, and if the bees do not take it, it will be offered to them later in the season. Bees at dry protein feeders are fun to watch, covering themselves with the dusty produce and then grooming themselves as they fly over the material. 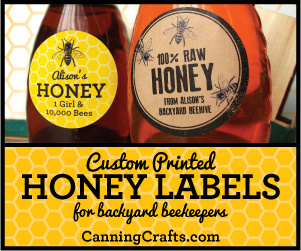 They are undoubtedly adding nectar and honey to the product as they pack it on their hind legs. As a rule, if there are few plants producing pollen, the bees will not find much nectar either. Nectar feeding using top feeders, jars or cans is a good way to offer 1 to 1 sugar syrup when the beekeeper is trying to build new combs, and 2 to 1 syrup when the objective is food storage. 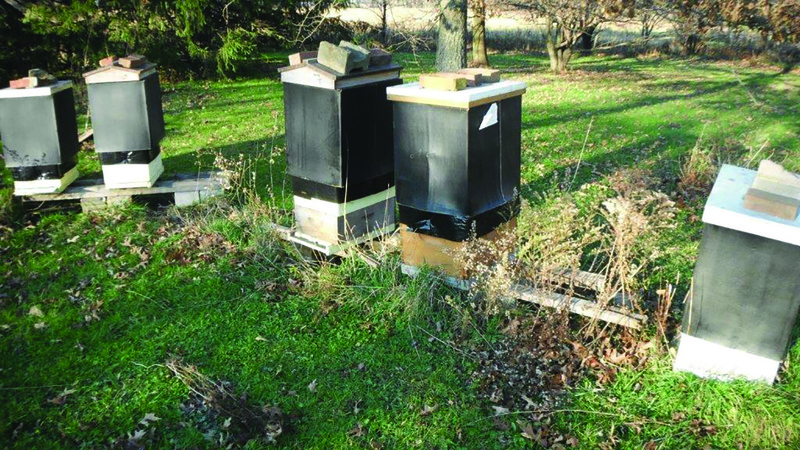 Small-scale beekeepers should not use open feeders for nectar feeding because the robbing bees will spread to their hives. Even commercial beekeepers who use open feeders tend to put the feeders some distance from the hives to minimize robbing in the apiary. 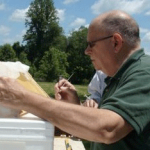 This past spring (2016), many beekeepers experienced the same thing that I observed: Certain colonies surviving the Winter into April, when a cold snap came and the bees died. Part of this was due to reduced colony population, but part of this was due to the lack of well-fed bees remaining from the previous season and the new bees that were being produced during the Winter being well fed as well. Fortunately, most of my colonies had adequate food from the previous season, and they were able to produce a large number of bees in the late Winter and early Spring. 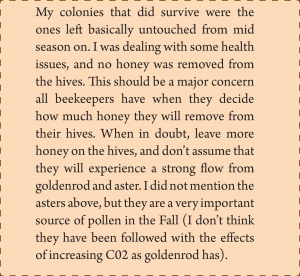 I did not see a lot of this, and the colonies that were lost were likely to have had a problem with higher Varroa mite loads and the viruses that tag along with mite infestations. What else are the bees doing from mid to late Summer? Replacing old and less than optimal queens. 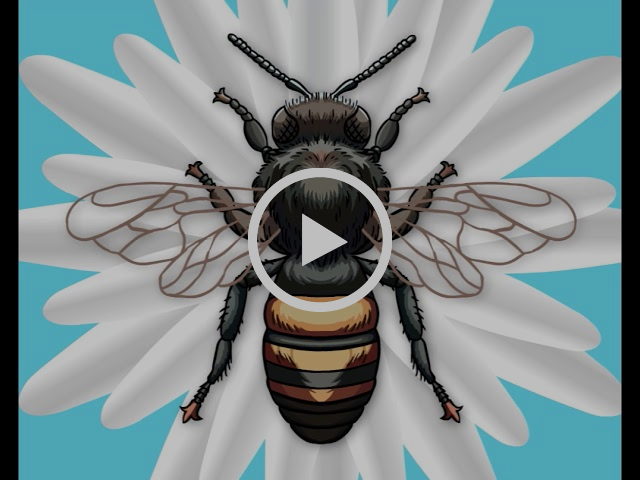 When a Spring swarm is lead by a colony’s old queen, this lady has built up two colony populations – the one that was strong enough to swarm and the swarm itself. By late July and early August and as the nectar flow is still on, the colony will quietly produce supersedure queen cells while the combs are being packed with nectar and honey. This is a bit of a lull that occurs just before the Happy New Year I just mentioned. These old queens are typically fading in brood rearing as a result of their fading viability and because of the seasonal decline typical of this time of the bee season. Likewise, colonies that were new earlier in the season, from packages or nuclei, we are also actively replacing any queen that is not producing queen pheromone at a level the colony expects. Old USDA studies from the 1930s report that about 35% of the queens in package colonies are replaced by the end of the bee season, so there should be no surprise that nowadays package colonies have a higher rate of queen replacement than 35%. 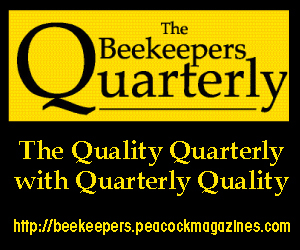 Some researchers have evidence that as many as 80% of the package queens are lost by the end of the first season, so the beekeeper should either prepare for the inevitable loss of colonies that is correlated with queen replacement, or actively replace queens that are failing with queens from the nuclei that they have hopefully established in their apiary. 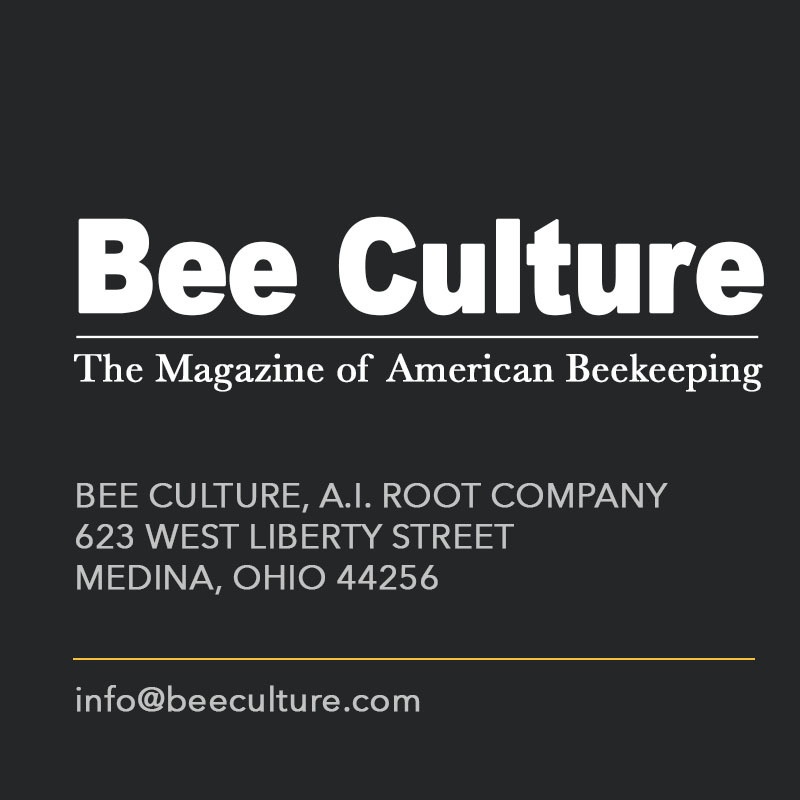 Even for first year beekeepers, having one or more nuclei on hand with young, viable queens is an ideal way to replace any queen that shows supersedure cells in the Summer and early Fall. This saves the time and money involved in getting a queen shipped, and an actively laying queen from a nucleus will always be accepted at a higher level than a shipped queen pulled by the producer from a queen bank. In Nature, queens fail to mate and reestablish the colony about 25% of the time. Even a young swarm may be at risk when the old queen is being superseded. Certainly any swarm or nucleus colony will face the same statistical risk of queen loss. 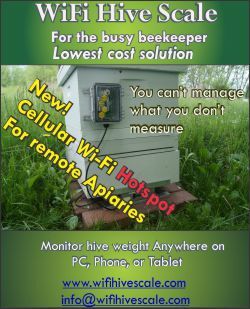 This is where the proactive beekeeper can save colonies and improve wintering success (in part by reducing mite levels by the brood break) by putting a young laying queen into a colony from a nucleus. 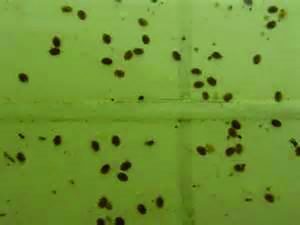 You only want three or so mites when you do a mite test. This colony is dead but doesn’t know it yet. 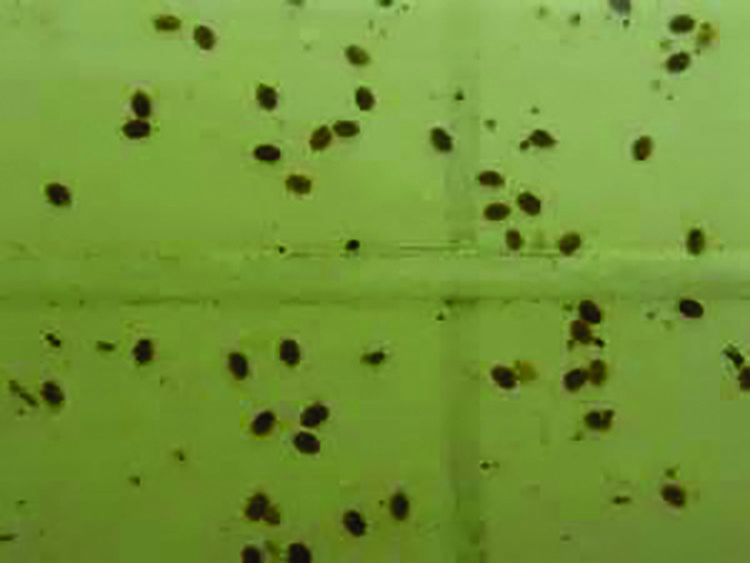 Mite control is often necessary in non-tolerant stocks. 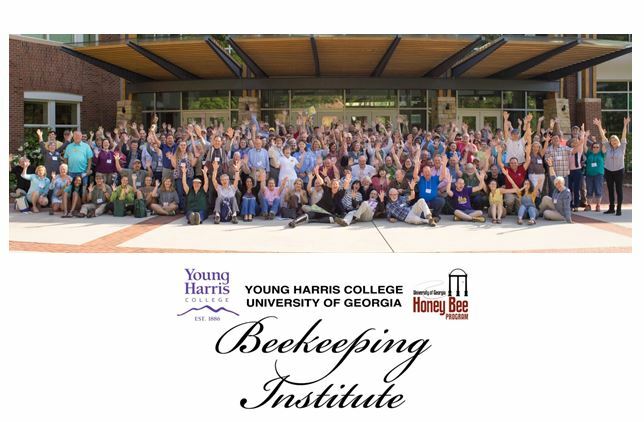 True, there is a growing number of beekeepers who do not medicate as the result of an active selection program against mites, and/or the purchase of stocks of bees that have one or more of the recognized mechanisms of mite tolerance: hygienic behavior, suppressed mite reproduction and grooming behavior. Many beekeepers sell their stock as being mite tolerant, but few beekeepers actually sample for mite levels. 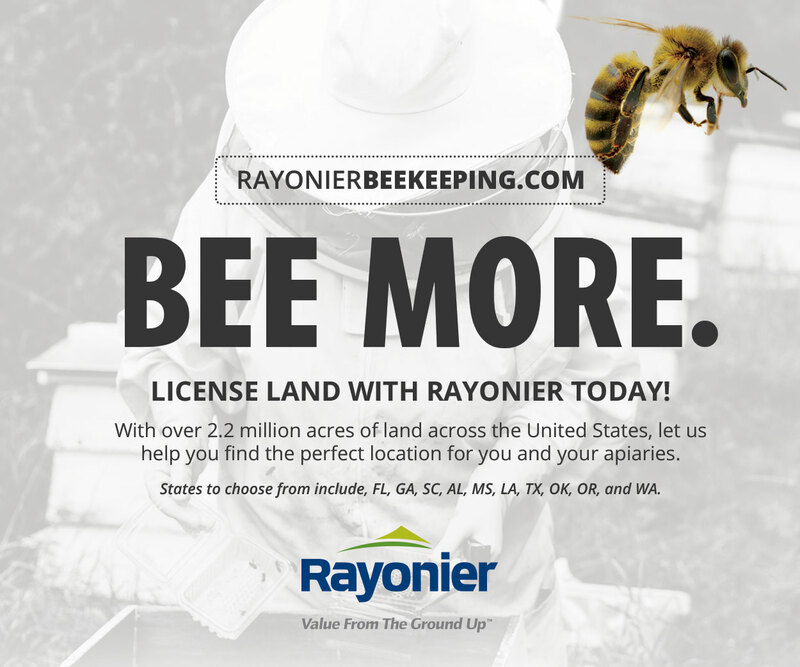 This is something all beekeepers should do on a regular basis. Sampling may be done using various methods. Some like to use their screened bottom boards and either count natural mite fall or apply a dusting of powdered sugar and count the number of mites that fall from the sugar treatment. This is a good indicator of general mite levels, but is less than precise in indicating when a beekeeper needs to treat. The powdered sugar roll is another method. A half-cup of bees from the brood frames is shaken into a tub and the bees measured out and put into a pint jar. That sample should be about 300 bees. Several tablespoons of powdered sugar are added and the bees shaken vigorously for five minutes, and then allowed to rest and let the sugar release the mites from the bees’ bodies. The mites and sugar are then shaken out onto a white surface (I use a white paper plate). I will apply more sugar and shake some more to make sure I get all the mites. 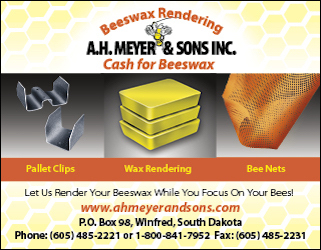 I want the mite count from the 300 bees to be less than three to six mites (one or two mites per hundred worker bees). I have performed sugar shakes with booming colonies that produced 40 to 80 mites per 300 bees. All indications are that such a colony is certainly likely to be dead in the Spring. In some cases, these colonies are dead by late Fall. In nature, such as a colony in a bee tree, bees will fill the upper combs with honey during the Summer and shift the brood rearing to the lower part of the nest. Managed bee colonies should attempt to duplicate this instinct. 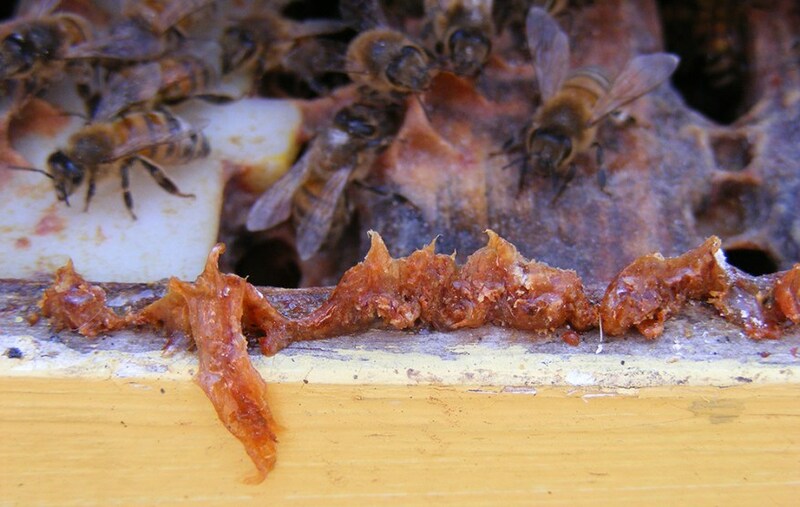 If the bees have moved up to the top of the brood chamber (filling honey supers above this), beekeepers are advised to move the brood nest to the lower hive body, and place brood frames filled with honey above the brood area. This will allow the bees to move upwards in the Winter. Heat rises and the bees will follow the heat as they Winter and eventually start to rear brood in the Winter. Once the bees are in cluster, they cannot move from the top box and crawl down to the stored honey and move it up unless there is a warm spell; and that can be very dangerous for the bees if the weather turns cold quickly and the bees are left stranded on the honey comb some distance from the brood cluster. Wrapping hives helps with Winter winds. Wind exposure is hard on the bee colony. Many of the colonies that survive are the ones that have good sun exposure and protection from the strong Winter winds. Colonies located in open fields and ridge tops are better off moved to thickets of brush, behind buildings and other protected areas. I think it is too early to move most colonies in August, but the beekeeper must develop a plan for this, lining up help and reducing the size of the colony so it will be easier to move. Most beekeepers wait until late November or early December to make the last visit and prepare the bees with insulation and ventilation. This may be the end of a mite treatment plan when the colony needs to be brood free. Note that Italian bees and some others will continue rearing brood as long as the weather is warm and there are adequate stores in the hive. When it is not possible to move colonies, make a windbreak from fencing material, bails of straw, wood pallets and other scrap materials. I like to have a one-inch insulation board between the inner cover of the hive and the top cover. This reduces heat loss and spreads the heat over the top of the hive, allowing the bees to spread their Winter cluster to reach more stored food. 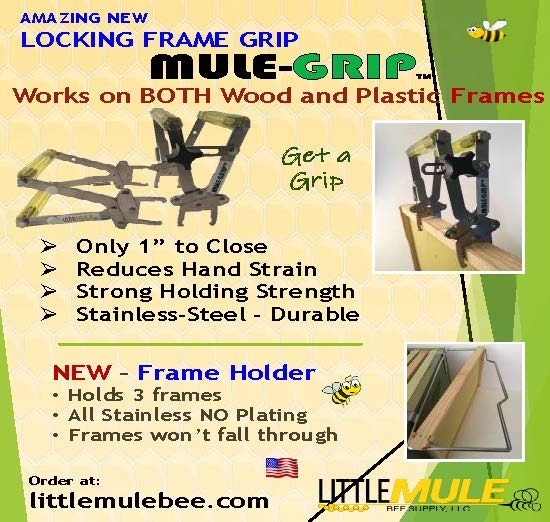 Provide an upper entrance in the top box, either as part of the inner cover or in a shim under the inner cover or an auger hole in the hive body. Studies done at Michigan State University started in the 1950s showed that an upper entrance was the most important Winter preparation a beekeeper could make to protect their hives. 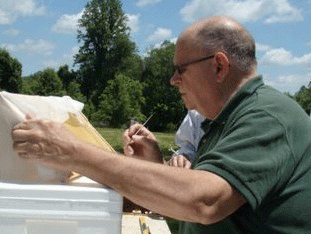 Some beekeepers wrap their hives with insulation board or roofing paper. This is helpful when the bees are exposed to strong winds. Dr. Connor is scheduled to speak at the College of Lake County (Grayslake IL) on Saturday September 10th. Remember to bring your copies of his books for an autograph. 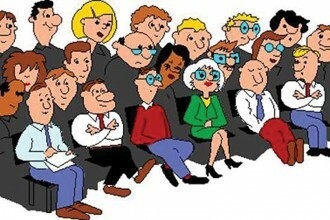 Look at www.wicwas.com for new titles and upcoming programs.